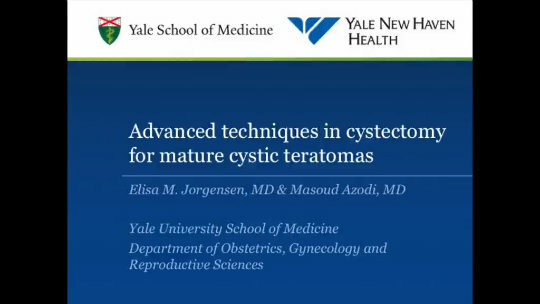 Dr. Jorgensen is Resident, Department of Obstetrics and Gynecology, Yale University School of Medicine, New Haven, Connecticut. Dr. Azodi is Professor, Department of Obstetrics and Gynecology, Division of Gynecologic Oncology, and Program Director, Minimally Invasive Surgery, Yale University School of Medicine. Brought to you by the Society of Gynecologic Surgeons. In this video, the surgeons offer 3 techniques to improve the efficiency and safety of laparoscopic ovarian cystectomy. They suggest manipulating the cyst entirely with a specimen removal bag. A rolling technique is used to dissect the ovarian tissue off the cyst in a more controlled manner than simple traction/countertraction. With very large cysts, a trocar is inserted into the cyst to allow for fluid removal, insufflation, and visualization of the inside of the cyst with a camera. Two case studies illustrate these techniques.